Henderson has a heel injury picked up in last week’s 1-0 win over Manchester City. Liverpool really missed Jordan Henderson on Monday as they failed to control the midfield against Sunderland. And the bad news is that the Reds are likely to be without their captain for two more games, with Jurgen Klopp telling BBC Sport that he expects the 26-year-old to be out for “about 10 days”. Klopp broke the news before kick off at the Stadium of Light, where his side drew 2-2, after twice losing their lead to Jermain Defoe penalties. If Henderson is indeed out for the next 10 days, he will be unavailable for the FA Cup third round clash with Plymouth Argyle and the first leg of the League Cup semi-final at Southampton. He should, however, be back in time to feature in Liverpool’s next Premier League fixture – the small matter of a trip to Old Trafford to play Manchester United on January 11. 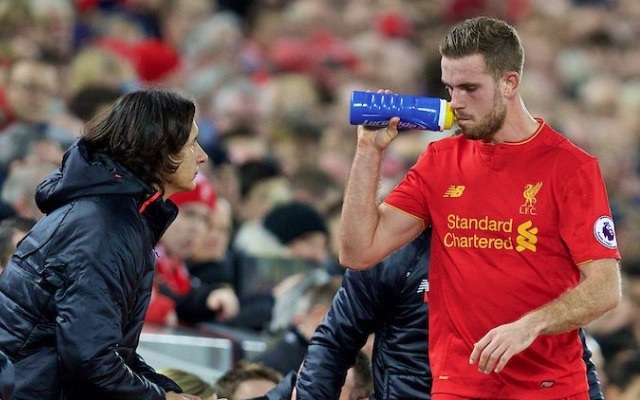 Henderson is not Klopp’s only injury concern. Philippe Coutinho, Joel Matip and Danny Ings also missed the draw with Sunderland, while James Milner and Daniel Sturridge were subbed off, with the latter limping as he left the field.